To add awards to soldiers, you must be logged into the AdminCP and access the soldier section of Personnel within the PERSCOM system. Review the Documentation Article BMO Access Overview for detailed instructions. Search for the soldier you wish to award. Click the drop down menu to the right and select Award Soldier. Select the appropriate options within the pop-up modal. Soldier - The soldier you selected will pre-populate. You can change to another soldier if needed. The date will pre-populate with the current time and date. You can change this if needed. Select the award from the drop down menu. Only one award may be processed at a time. Send notification is pre-selected. You may choose to not send a notification if this is a duplicate or correction of a mistake. Click the Save button, the soldier has now been awarded! You may need to award many soldiers the same award, such as the Good Conduct Medal after a ceremony. The following steps can be used for batch awards. Note: Only one award can be batch processed at a time. There are two methods for selecting soldiers to award, either works and is up to your preference. Find the soldiers you wish to award from the Soldiers list and check the select box on the right. You may need to go page by page to find the soldiers. It may also be helpful to sort by rank, combat unit, position, or status. Filtering by status could also be helpful. From the pop-up menu on the bottom, select Award Soldier. Soldier - The soldiers you selected will pre-populate. You can use the drop down menu to select additional soldiers or deselect soldiers. 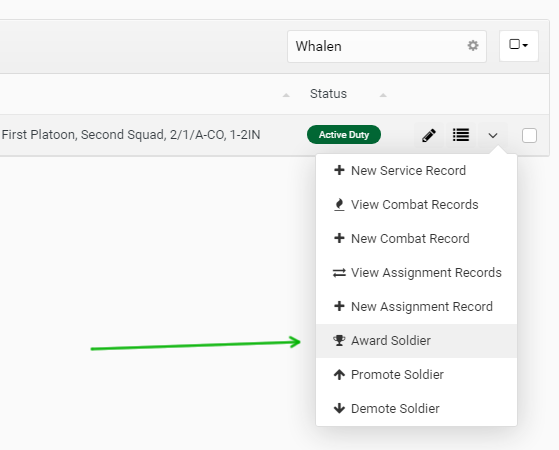 Find any soldier you wish to award from the Soldiers list and check the select box on the right. You can even simply choose the first soldier in the list, but be sure to deselect them in step 3 if they are not receiving the current award. Soldier - The soldier you selected will pre-populate. You can use the drop down menu to select additional soldiers or deselect soldiers. Again, if you chose a soldier not selected for the current award as a shortcut to this screen, be sure to deselect them from the list!